As the soft strains of composer Michael Holm’s elegiac leitmotif open Mark of the Devil, audiences are greeted with a serene, pastoral scene of nuns on a countryside stroll. It almost begs one to wonder—theaters handed out barf bags for this? Within a couple of minutes, however, it leaves no doubt, as the clerical convoy is suddenly attacked by a pack of wild men wearing distinguished military garb. The nuns are swiftly raped and further brutalized before the film reveals its first shocker: these are officials of the state carrying out their duties as witch-hunters. Dig beneath the film’s notoriety and vomitous reputation, and you’ll discover that this is its true terror. While Mark of the Devil is rather on the nose about its musings about power, corruption, and persecutions, it’s nonetheless staggering and disturbing. It doesn’t tell a story as much as it plunges viewers into a maelstrom of deception, fraud, and hypocrisy that only becomes more pronounced as it climbs the social ladder. As local officials, the goons (Reggie Nelder & Herbut Fux) from the opening scene only represent the bottom rungs in the pecking order: it turns out these guys are basically the scum on the boots of Lord Cumberland (Herbert Lom) and his apprentice (Udo Kier). Ostensibly, these two are meant to ride into town to restore order; in reality, the unjust arrests, torture, and executions escalate to absurd levels. From a narrative standpoint, Mark of the Devil is a shaggy affair, one that features an awkward narration after its first couple of scenes that confirms its basis in the historical exploits of actual 18th-century fanatics. From there, it roves from one deranged episode to the next as Cumberland and his men target various citizens, from a young man whose inheritance is set to go to the church in the event of his death to a husband-and-wife duo accused of manning puppet shows fuelled by the devil. Unifying the proceedings are the apprentice’s growing disenchantment after falling for one of the village’s buxom bombshells (Olivera Katarina, bewitching as hell) and the galling, unrepentant measures these men take to destroy everyone in their path, including each other. Essentially mining the same historical material as witchcraft landmarks Haxan and The Crucible, Mark of the Devil reveals the outrageous, criminally unfair tactics employed by those in power during this time. Arbitrary tests, forced confessions, and shady indictments condemn the damned in infuriating fashion, much in the same manner as previous texts. Where Devil departs is in its calling card, and I use that term quite literally since its original German title is translated as Witches Are Tortured to Death. Between this and its infamous marketing campaign, the film doesn’t mince words about its macabre aim to turn stomachs, nor does it fail to deliver on the promise. Forty-five years after its release, Mark of the Devil is still one of the most effective splatter films ever made. Its gags—particularly its most infamous tongue-ripping sequence—are both squirm inducing and remarkable achievements in practical effects. Each scene feels more horrifying than the last because they're so unflinching and devoid of style: bodies are callously maimed, decapitated, and set ablaze on funeral pyres with little fanfare, and the film even takes time to explore psychological torments, like Chinese water torture. Set in an Austrian castle that actually served as a theater for historical witch-hunts, Mark of the Devil strives to be a historical document despite its sensationalized marketing—it’s only as outrageous as the actual events themselves, it would seem. British director Michael Armstrong brings a sturdy confidence to a tricky film. 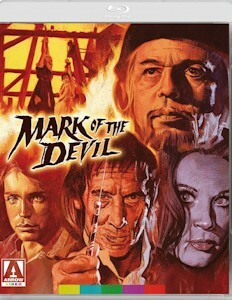 Charged with balancing the shlock with a grounded, chilling story, he finds a harmony in a familiar aesthetic: between his exquisite compositions, his rustic mise-en-scene, and his casting of several lovely ladies, Mark of the Devil feels like a Hammer film gone haywire. It feels both classical and a little broad all at once, an appropriate feel for a film that oscillates between genuine horror and absurdity. This full range is particularly reflected by Armstrong’s highlighting of various faces: the silly, rat-like, hound-dog countenances of Nelder and Fux contrast with Kier’s boyish, heroic features, while Lom covers the entire spectrum. He’s tortured, maniacal, austere, and gregarious all at once, though he becomes more unhinged as the proceedings (and implications of his impotency) unravel. The look on his face when a woman is accused of blighting the land with impotence says it all: this is a sad, emasculated man looking to overcompensate. The most haunting, unforgettable faces belong to the victims. Truth be told, the torture sequences are mostly uncomfortable because Armstrong often pushes right in on their hysterical, frenzied reactions, their screams proving to be more disturbing than any of the explicit violence. Armstrong scatters similar perceptive choices throughout, such as a glimpse of Kier’s disgusted reaction to the horrors before him, or a lingering shot of a bloodied, battered body. He reserves one of his most powerful, contemplative images for last: after capturing a hectic peasant uprising (there’s a faint Marxist thread rumbling beneath the surface that anticipates Andy Warhol and Paul Morrisey’s blood-spattered manifestos) that splays body parts all over the village square, Armstrong has viewers endure one final act of torture. Rather than fully exploit the act, however, he lingers on the aftermath, a quiet moment before Holm’s incongruent score shuttles the audience away—again, in a state of bewilderment, only this time they’re perhaps surprised that Mark of the Devil has proven to be truly disquieting beyond its “Rated V for Violence” boasts. The latest release of Mark of the Devil is a cause for celebration in more ways than one. Not only has the film finally received a long-deserved upgrade to Blu-ray, but it also comes courtesy of Arrow Video, which is making its long-awaited debut in North America. For years, Arrow has proven to be a premiere boutique label in the UK, and genre fans across the Atlantic have reason to rejoice, especially if this first release is any indication. The high-definition transfer here remarkably preserves a nearly flawless print that retains a fine grain structure in addition to sharp details and vivid colors. Both English and German audio tracks are available, with the latter sounding a tad crisper and cleaner upon inspection. A bevy of supplements have made the trip across the pond, with a commentary by Armstrong serving as the headliner. The other main feature is Mark of the Times, a new, 47-minute long documentary chronicling the careers Armstrong and his fellow “British New Wave” directors, with input from Kim Newman and Peter Hutchings. “Hallmark of the Devil” is a brief feature that has Michael Gingold reflecting on Hallmark Releasing, the film’s distributor which (obviously) specialized in “creative” marketing. Various interviews with the cast provide more information, while a “Now and Then” segment revisits the film’s locations four decades later. Over 30 minutes of outtakes and a still gallery complete an impressive package that spells good things to come. Genre fans who never took the region-free plunge are in for quite a treat. In fact, we might find ourselves downright spoiled by what is rapidly becoming a new golden age for cult film on home video.